Pack up Whiskers. It’s almost National Take Your Cat to the Vet Week! 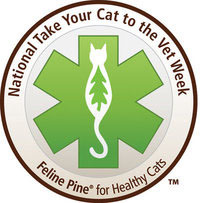 Feline Pine created National Take Your Cat to the Vet Week, to be honored this year from August 16 through 22. For some mysterious reason, more dogs go to the vet than cats, yet more cats live with people as pets! Cats may think they have it good by getting out of seeing the vet, but we know better. They need to see the vet just like dogs. And they can cover up their illnesses very well. Kitty could need help and you’d never know it. So, see you at the vet’s office next week?